The first thing that comes to our mind when we hear the word operating system is the software program used in our desktop computers and laptops such as Microsoft Windows, Linux, Ubuntu, etc, and Android for smartphones. In fact, most of the digital electronic devices run some sort of operating system inside which is developed by the microcontroller program. The evolution of microcontroller has paved way for numerous embedded system applications which play a crucial role in our day-to-day life one way or another. One such system we’ve been hearing about lately is the Real Time Operating System, or simply referred to as “RTOS”. The RTOS is an operating system that’s used for real-time applications meaning the applications that process data as it comes in within a specified time constraint. QNX and VxWorks are two different real time operating systems, largely used in industrial and academic environments. The purpose of the article is to do an unbiased comparison between the two. QNX is a commercial real-time operating system initially developed for embedded systems and was originally developed by Quantum Software Systems in the early 1980s. The Canada-based company was later renamed QNX Software Systems and ultimately acquired by Research in Motion (RIM) for use as the foundation for their BlackBerry 10 OS and then-popular BlackBerry Playbook. The version of the OS used in the Playbook was QNX Neutrino which was built on a true microkernel architecture. QNX was the first commercially successful microkernel-based operating system. QNX is basically a Unix-like operating system based on a true microkernel design and modular architecture where the elements of the operating system run as tasks, known as Resource Managers, which would allow the developers to turn off any functionality that they think isn’t required anymore in the particular system. The best thing about QNX is it’s based on message-based interprocess communication. VxWorks is a real-time operating system specifically designed for distributed computing for real time applications with embedded systems. It’s a proprietary real-time operating system developed by Wind River Systems, a California-based company specialized in developing embedded software for intelligent connected systems. VxWorks is the industry-leading RTOS that has been building embedded systems and devices for over three decades. It’s a monolithic kernel with extensive inter-process communications and synchronizing functions. Each build of the VxWorks is unique because of its architecture where the entire operating system works in the kernel space meaning all the kernel services and the user services exist in the same address space which makes the execution of the operating system faster. It provides debugging functions, performance monitoring, memory management, CPU scheduling, and other operating system functions through system calls. Both are very unique real-time operating systems specifically intended for real-time applications with embedded systems, each with loads of different components with different functionalities. Both the systems are widely used in large industrial and academic environments and have been in business for over decades. QNX is a commercial RTOS developed by Canada-based Quantum Software Systems in the early 1980s, which was later acquired by RIM in 2010. VxWorks is a proprietary software developed by California-based Wind River Systems, the industry-leader specialized in building embedded software for intelligent connected products and systems. Both the operating systems use real-time kernel for mission-critical applications that process data as it comes in meaning the system subjects to a real-time constraint which guarantees response within pre-defined time constraints, otherwise known as ‘deadlines’. The main difference lies in the architecture – while QNX is based on a message passing architecture, VxWorks lends itself to shared memory architecture. Message passing is fundamental to the kernel design which allows the system to pass information from one task to another or to several others in the system. Shared memory architecture refers to a system which has its own private address space for physically distributed memories. One of the key differences between the two real-time operating systems is that QNX is a microkernel-based OS whereas VxWorks is a monolithic kernel. A microkernel is like a small operating system that leverages system calls to manage basic services like address space management, thread management, and interprocess communications. It refers to a system which requires a limited set of primitives and minimum software dependency to implement an OS. A monolithic kernel, on the other hand, manages all the basic services and user-defined services including inter-process communications in a protected kernel space. 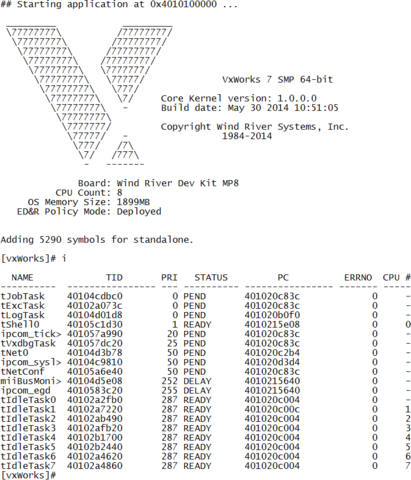 As a monolithic kernel, VxWorks is self-contained. Every thread or process has its own priority in QNX. Under QNX, all the processes run on a priority-driven preemptive basis meaning the process with the highest priority gets to access the CPU first and the priorities range from 0 to 31. The scheduling occurs in real-time and every thread inherits its parent’s priority by default. When two threads share the same priority, other scheduling methods are used by the QNX such as FIFO, Round-Robin, and Sporadic Scheduling. VxWorks, on the other hand, uses only two types of scheduling algorithms, preemptive priority-based and Round-Robin scheduling. Together they provide a greater degree of control to the users for efficient scheduling. Both are kernel-based real-time operating systems intended for real-time applications that require tasks to be processed and completed as they come in within a pre-defined time constraint, otherwise referred to as deadlines. Both are in the business for over 25 years and are specialized in developing embedded products and systems, but this is where all the similarities end. QNX is a microkernel-based real-time operating system which is rather fascinating on its own, thanks to its message passing based architecture which is ideal for making reliable distributed systems. VxWorks is a monolithic kernel based on shared memory architecture which makes it ideal for large industrial environments such as automotive systems, avionics, consumer electronics, etc. Sagar Khillar. 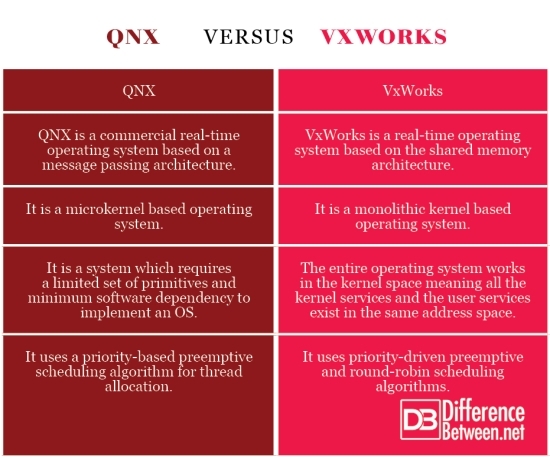 "Difference Between QNX and VxWorks." DifferenceBetween.net. August 9, 2018 < http://www.differencebetween.net/technology/difference-between-qnx-and-vxworks/ >.